Posted March 12, 2019 by Karen Jones & filed under Centre News. Each wanted cartridge that is recycled will raise £1 for the charity. Makes you can recycle include HP, Dell, Lexmark, Canon, Samsung, Neopost. Inkjet cartridges must be in suitable condition to be recycled. Only virgin cartridges on our wanted items list raise money for charity when recycled. All inkjet cartridges must pass a visual inspection & electrical test. “Virgin Cartridges” mean cartridges which have not been refilled before and carry only the original equipment manufacturers branding. We do not accept laser & toner cartridges through this recycling service. Posted March 7, 2019 by Karen Jones & filed under MS News. A ground-breaking clinical research trial is inviting people living with Multiple Sclerosis (MS) to take part in the evaluation of a balance exercise program using a robotic walking device. This trial is the only research trial in this field taking place in the UK for people diagnosed and living with MS. The trial is pioneering the use of a robotic walking device to enable and support a balance rehabilitation program for people diagnosed with MS, who have balance issues. The research team is led by Dr Mohamed Sakel (FRCP, UK), who is Consultant Physician in Neuro-rehabilitation and Director of the Neuro-rehabilitation Service for East Kent Hospitals University NHS Foundation Trust (EKHUFT). Dr Sakel regularly sees patients living with MS, who present with balance issues in his out-patient clinics throughout East Kent. Dr Sakel is passionate about enabling and empowering patients, their families and carers and building further understanding of effective neuro-rehabilitation interventions for balance and quality of life. Dr Sakel’s research team are passionate about gaining more understanding of how people living with a long-term condition, such as MS, can be supported to optimise their balance, wellbeing, health and quality of life. This unique trial is open to people diagnosed with MS, who are aged between 18 and 80, and are able to walk a minimum of 8 metres using a walking aid. Interested volunteers are kindly invited to contact Karen Saunders (Consultant Clinical & Research Neuro-physiotherapist) either by email karen.saunders10@nhs.net or telephone 07920785768. For this trial, potential participants are invited to undertake a 2 – stage screening process (first stage by telephone, and second stage via face to face appointment in Canterbury). Then, if eligible, the potential participant would be invited to take part in the trial. The trial itself is based at Kent & Canterbury Hospital and comprises 7 appointment sessions over a period of 7 weekends. 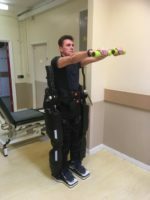 The study is focused on the evaluation of a balance rehabilitation program enabled by the use of a Rex exoskeleton device. The balance exercise program is specifically designed to focus on increasing core body muscle strength, improving balance related skills and walking ability. 1. To evaluate the feasibility and safety of the Rex robotic walking device when used for rehabilitation with people, who have mobility restrictions due to MS.
2.To assess and evaluate the effectiveness of a 5-week robotic assisted exercise program focused on balance, mobility and quality of life using a range of patient related outcome measures, selected clinical scales and physiological measurements. 3.To gain an insight into the experiences of participants and their spouses/partners/close carer of using the robotic walking device for rehabilitation and how this has impacted on their lives. 20 participants (aged between 18 and 80) with a primary diagnosis of MS will be invited to take part in this trial. All potential candidates will have balance issues related to MS and be able to walk a minimum of 8 metres using a walking aid. There are 2 screening stages and if successful at both stages, then eligible participants will be invited to take part in a five-week balance rehabilitation intervention program. The intervention comprises a once weekly Rex robot assisted balance exercise program under the supervision of the trial neuro-physiotherapist (Karen Saunders). The aim of the program is to specifically increase core muscle strength, improve balance related skills and walking ability. Within the trial, the device is used as an enabler to give the individual the ability to stand and walk easily supported by the device without the need of a walking aid. The person is able to relax their arms and stand in an upright posture which enables balance rehabilitation exercises to be done safely and securely. The device is battery powered and controlled by the use of a joystick. The response to the balance intervention program will be monitored closely and continuously by Karen and the Principal Investigator, Dr Mohamed Sakel. Participants will be progressed throughout the treatment program as appropriate and a range of standardised assessments, questionnaires and clinical scales will be used to measure change related to this trial. The trial is further enhanced by a qualitative research study, in which individual participants will be invited to take part in 1 to 1 interviews and spouses and partners will be invited to take part in focus groups. This will enhance the understanding and insights gained of how participants have experienced this new rehabilitation intervention and how this has may have impacted on their lives and those of their spouse/partner. Source MS Society: We know around 90% of people with MS experience fatigue, which can severely impact their quality of life. Researchers at Oxford Brookes University looked at whether flavonoid-rich hot chocolate was able to provide a benefit to people with MS fatigue. 40 people took part in the trial – half drank a flavonoid-rich hot chocolate drink once a day for six weeks and the other half a low-flavonoid alternative. They found that a daily drink of flavonoid-rich hot chocolate could have a positive long-term effect on fatigue. It is thought that the drink could also influence mood, cognitive performance, and the ability to perform certain movements. Flavonoids (a compound found in various plant-based foods, including raw cacao) are known for their high antioxidant properties, and researchers believe their positive influence on MS is because they reduce inflammation in the body. The results from this feasibility trial – the first of its kind – mean researchers are one step closer to giving people with MS another way to manage their fatigue. Read on. Posted March 1, 2019 by Karen Jones & filed under Centre News. A member had a treatment with Natalie McTimoney Chiropractor on Thursday and this is what she had to say about her treatment. Posted February 28, 2019 by Karen Jones & filed under Centre News. Our new therapy McTimoney Chiropractor Natalie started at the centre today (28/2/19). Feedback is very positive with repeat bookings straight away. If you would like an appointment Natalie is in weekly on Thursday mornings. Sue’s daughter is doing ‘brave the shave’ for McMillan, as her Granddad has cancer. Feel free to donate or share. Posted February 26, 2019 by Karen Jones & filed under Centre News. MS Awareness Week and World MS Day MS Awareness Week will be between 22 – 28 April and would be the perfect opportunity to host an event to raise awareness and funds for the Centre. Have you got an idea? Posted February 15, 2019 by Karen Jones & filed under MS News. Results were reported in the study “Real-world durability of relapse rate reduction in patients with multiple sclerosis receiving fingolimod for up to 3 years: a retrospective US claims database analysis,” published in the Journal of the Neurological Sciences. Gilenya, marketed by Novartis, is an oral disease-modifying treatment for relapsing-remitting multiple sclerosis (RRMS), approved in 2010. It acts by binding and modulating receptors — called sphingosine-1-phosphate receptor — on lymphocytes (adaptive immune cells). Read on. Posted February 15, 2019 by Karen Jones & filed under Uncategorized. Posted February 15, 2019 by Karen Jones & filed under MS Society Local Branch.